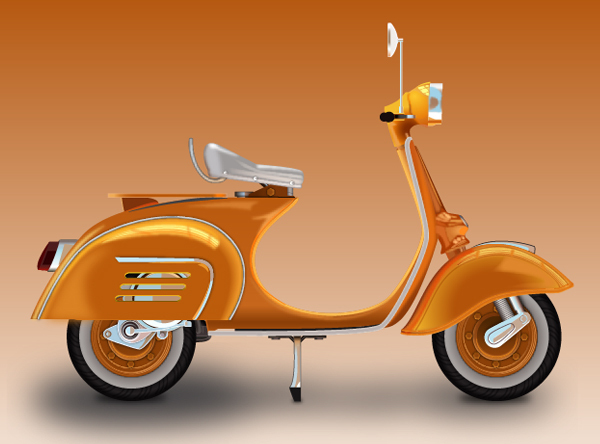 You’ll start by creating the main shapes of the vespa, using the Pen Tool and Ellipse Tool, along with the Offset Path and the Pathfinder palette. Next, using complex gradients, basic blending, masking and vector shape building techniques along with some effects you’ll add depth and shading to your shapes. 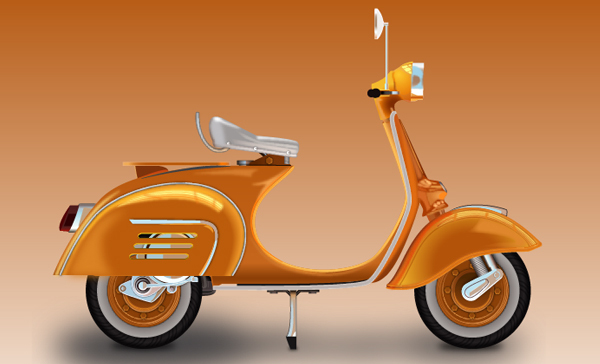 Finally, you’ll learn how to add a few more subtle details, highlights and shadows for your vespa. Launch Illustrator and then press (Ctrl + N) to create a New document. Select Pixels from the Units drop-down menu, enter 950 in the width box and 720 in the height box then click on the Advanced button. 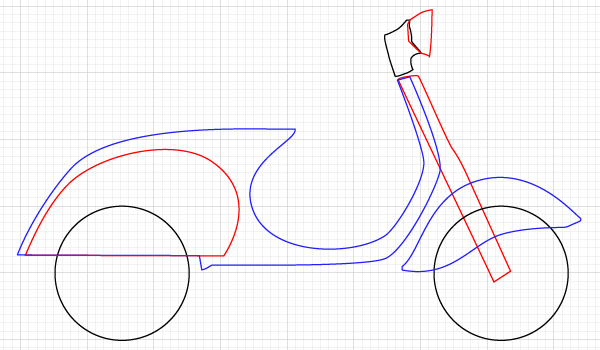 Select RGB, Screen (72ppi) and make sure that the Align New Objects to Pixel Grid box is unchecked before you click OK.
Let’s start by creating the main shapes of the vespa. 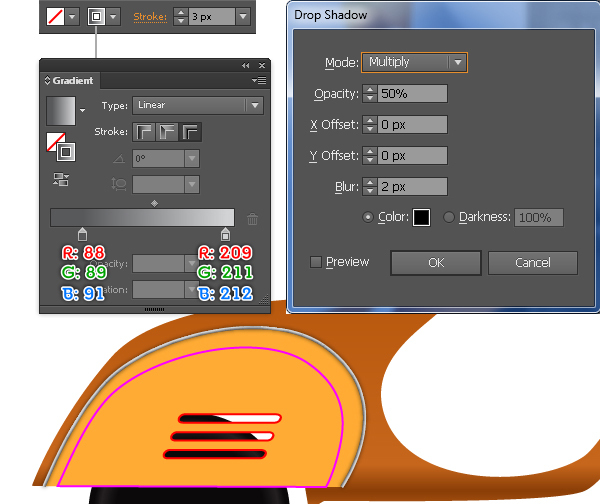 Pick the Ellipse Tool (L) and create a 200 by 200px ellipse. 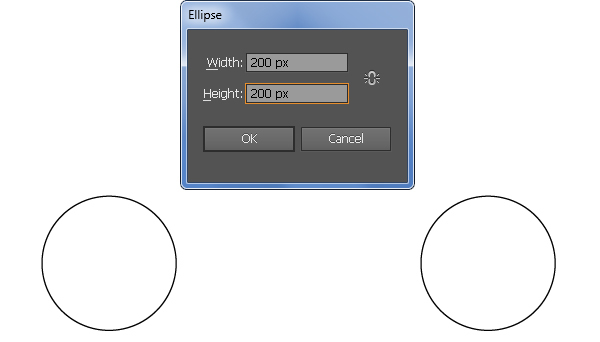 Make a copy (Ctrl +C, Ctrl +F) of the ellipse and then move the copy 570px to the right. 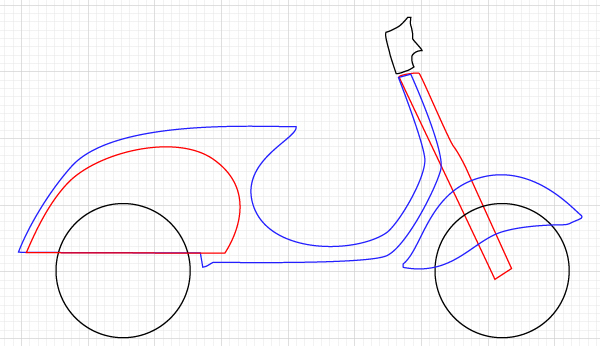 With the Pen Tool (P) create objects as you see in the images below. In the end your objects should look like the final image shown. 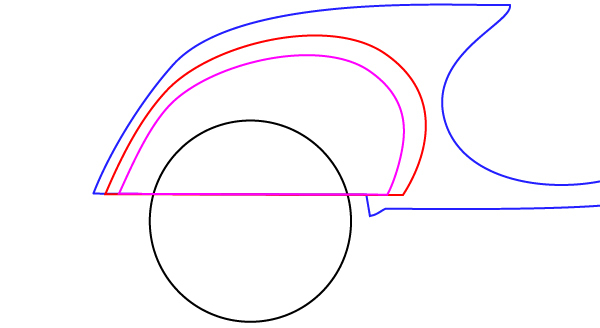 Focus on the lateral covers and create a magenta object using the Pen Tool (P). Once your object is drawn, duplicate (Ctrl +C, Ctrl +F) it once and then press (Ctrl +2) to lock the copy. 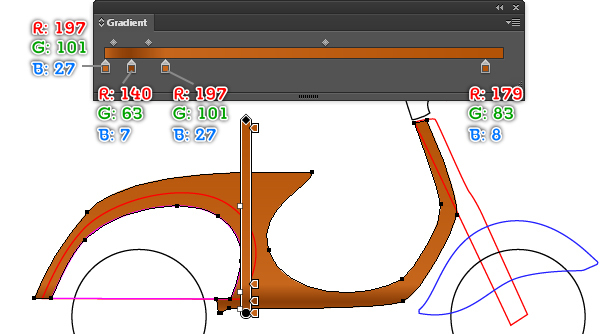 Now reselect the magenta object and the bodywork object, then open the Pathfinder palette (Window > Pathfinder) and click on the Minus Front button. 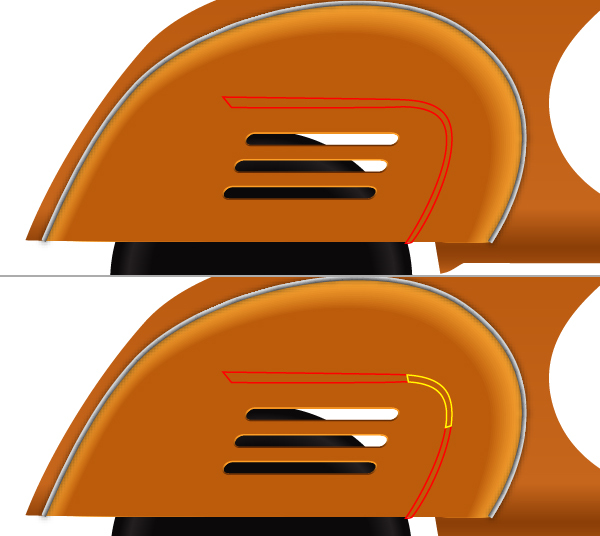 Next fill the resulting object with the linear gradient as shown in the third image below. Follow the sequence of images and fill objects created in the previous steps similar to the ones from below. First we will create the lateral covers. Pick the Rounded Rectangle Tool and click on the artboard. 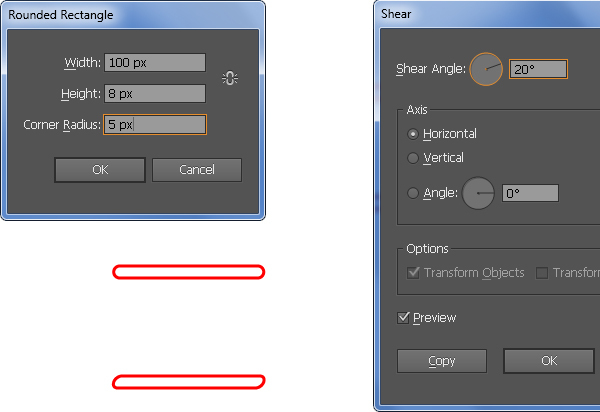 In the Rounded Rectangle dialog box, enter a 100 in the Width box, enter a 8 in the Height box and enter a 5 in the Corner Radius box, then click OK.
Keep the new object selected and go to the Object > Transform > Shear… In the Shear box, follow the data as shown below and click OK.
Next make two copies (Ctrl +C, Ctrl +F, Ctrl +F) of the resulting object and then place three newly created objects to the correct positions as you see in the second image. Select four red objects and duplicate (Ctrl +C, Ctrl +F) them once, then hide the copies (Ctrl +3). Reselect four red objects again, open the Pathfinder palette (Window > Pathfinder) and click on the Minus Front button, then fill the resulting object with R=255, G=171, B=52. Before you continue, press (Ctrl +Alt +3) to show four red objects hidden in the previous step. 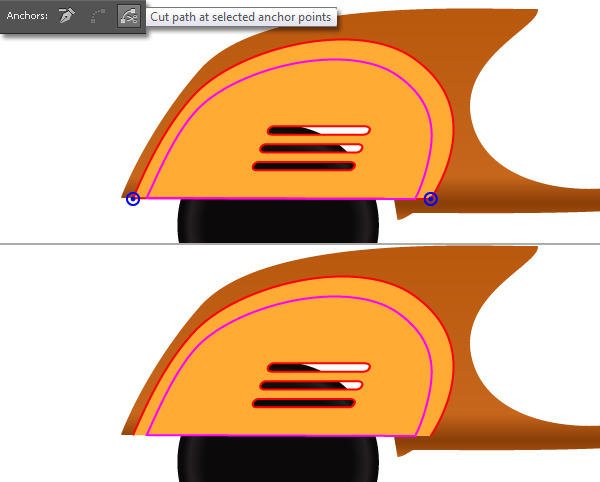 Now focus on the big red object and select the two anchor points highlighted with blue, then click on the "Cut path at selected anchor points" button from the Properties bar. This make the object become two paths. Select the straight path and remove it. Next select the remaining path, fill it with none and add a 3px stroke (apply the linear gradient across stroke). 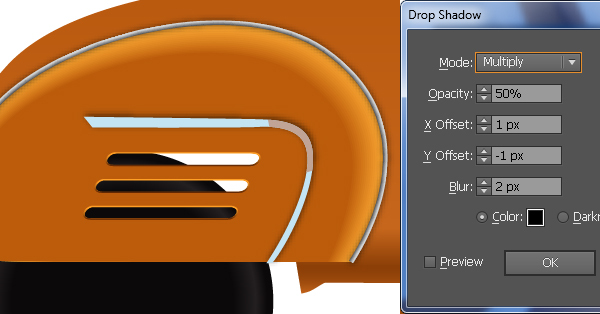 Keep the resulting path selected and go to the Effect > Stylize > Drop Shadow… Follow the data as shown in the second image and click OK.
Press (Ctrl +Alt +2) to unlock the magenta object locked in step 4. Next select three red objects and duplicate (Ctrl +C, Ctrl +F) them once. 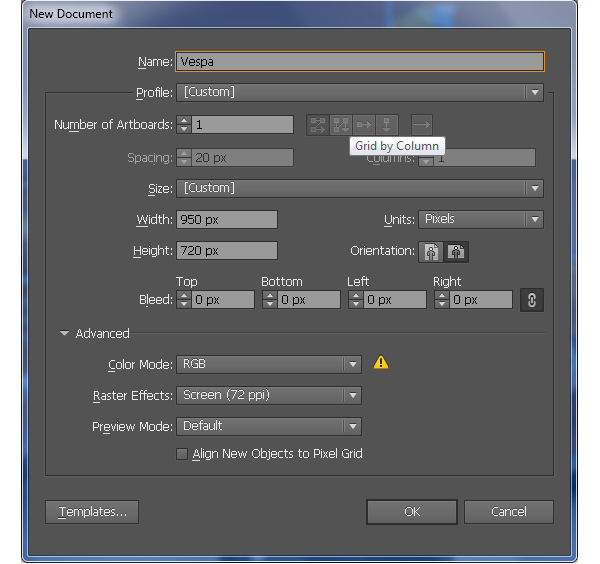 Keep the copies selected, hold down the Shift key and click on the magenta object, then click on the Minus Front button from the Pathfinder palette. Next fill the resulting object with R=188, G=92, B=11. 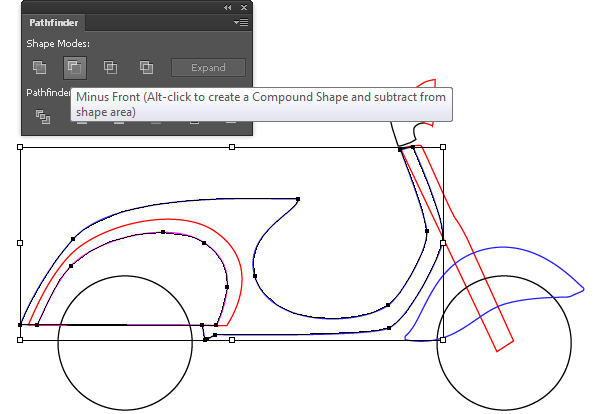 Make sure that the resulting shape is still selected, hold down the Shift key and click on the shape created in step 7. Then go to the Object > Blend > Blend Options… Follow the data as shown in the third image and click OK, then go to the Object > Blend > Make (Ctrl +Alt +B). Select three red objects and bring them to front (Ctrl +Shift +Right Square Bracket). Next replace the existing stroke color of them with the linear gradient within stroke as shown below. 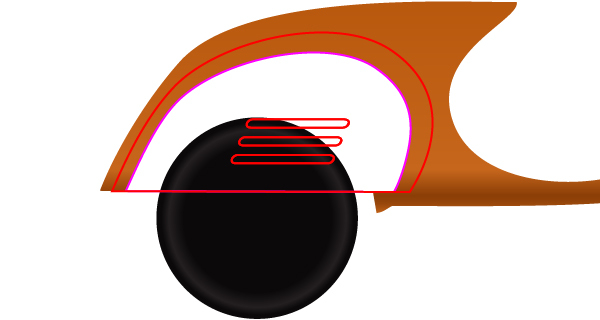 To add some details, first draw two objects using the Pen Tool (P) as shown in the images below. 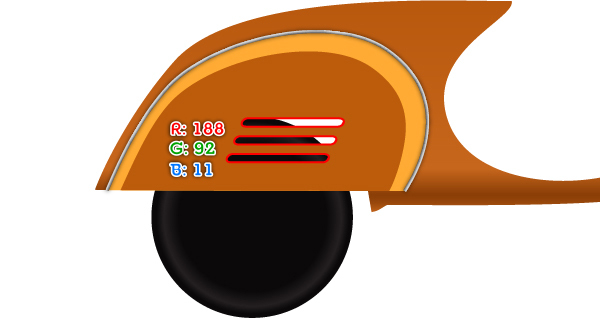 Once your objects are drawn, fill the yellow object with R=193, G=164, B=149. 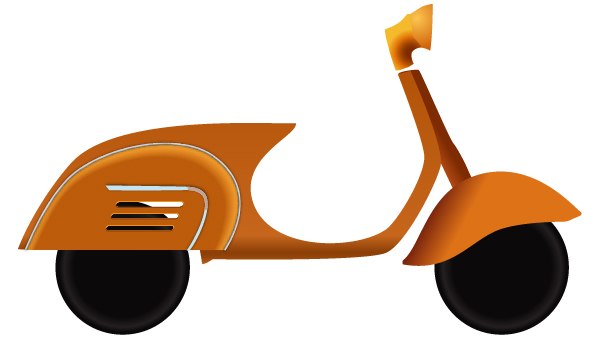 Next fill the red object with R=95, G=228, B=243 and then go to the Effect > Stylize > Drop Shadow… Follow the data as shown in the fourth image and click OK.
At this point your vespa should look like in the final image.